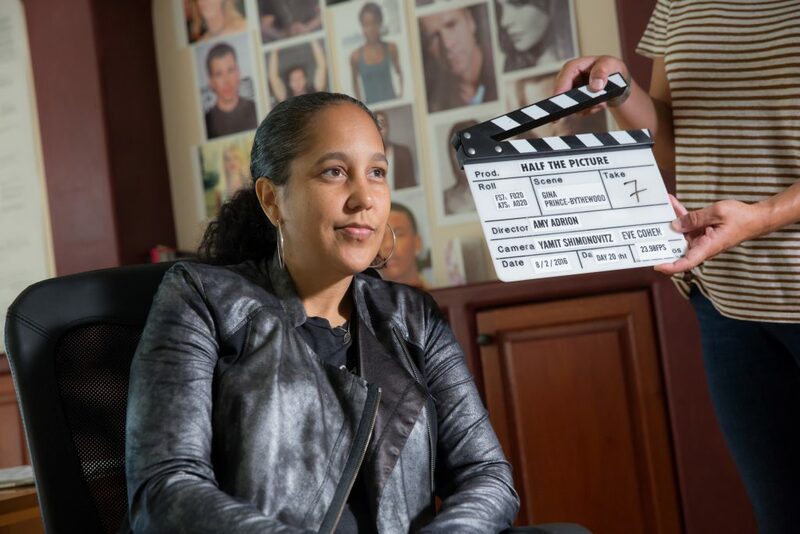 Documentarian Amy Adrion has created what amounts to a love letter to female filmmakers in her new film, Half the Picture, which supporters of women in film will love to know is now available on demand*. 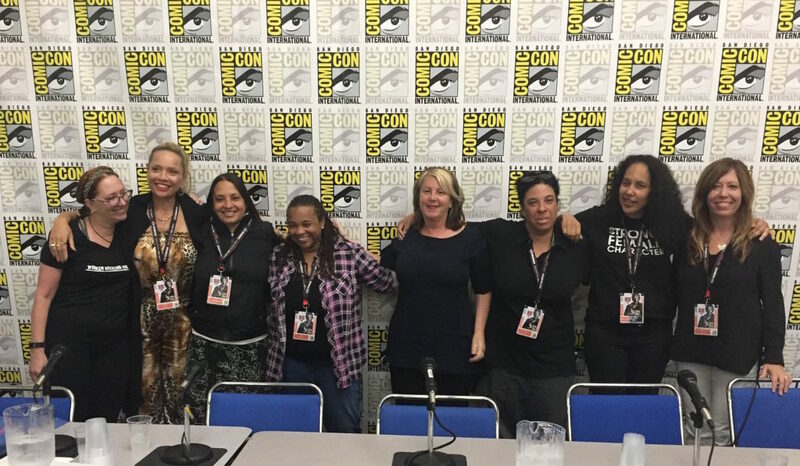 I was at San Diego Comic-Con last week preparing for and conducting the panel Women Rocking Hollywood, that features women in film. After I would tell people what I do at the convention, I would ask film fans if they could name five female filmmakers. Almost all were at a loss. In the 90 year history of the Oscars, there have been 442 nominees in the directing category. Only 5 have been women, and only 1 woman has won. Did you know women now make up 51% of the audience at movie theaters? Women outnumber men in box office numbers. To say they are decidedly underserved is an understatement. Those of us in the trenches, the female film critics, the agents of female filmmakers and crew, the publicists of women in film, all know the startling, depressing statistics , and know they aren’t changing nearly fast enough. If you want to know how truly problematic the disparity between men and women directing studio films in 2018 and the foreseeable future is, click here for some sobering numbers. What Amy Adrion’s film does is gives airtime and a platform for some of the most talented, experienced, and often frustrated women working inside Hollywood and outside of it in independent film. Don’t think, though, that the film is filled with women complaining. It isn’t. It really feels, as one watches it, like a celebration, or, for those don’t know who these women are, an introduction. These fearless ladies are so passionate and so committed to their art, they repeatedly find a way to make it work, even under the most difficult circumstances. As part of the film, we hear from a wide variety female film luminaries, including Ava DuVernay, **Catherine Hardwicke, **Gina Prince-Bythewood, Brenda Chapman, **Patricia Riggen, Jill Soloway, Miranda July, **Patricia Cardoso, Martha Coolidge, Lesli Linka Glatter, Karyn Kusama, **Tina Mabry, Penelope Spheeris, and **Kirsten Schaffer, to name a few. All have created enduring, powerful, successful works on film, or are advocates committed to raising awareness and making lasting change in the industry. Sometimes their interviews are inspiring, sometimes heartbreaking, but they are always heartfelt and enlightening. None of these women shy away from expressing the difficulties and struggles inherent to their craft. They bluntly speak of their challenges, while explaining why they keep at it, despite them. It’s a testament to Adrion, who is often seen on camera, that she creates a safe space for these artists to speak their truth. It’s also lovely to see, (if, as I’ve repeatedly suggested, you look on IMDB to confirm there are female members of the crew) and see the room in which they are filming these exceptional talents is filled with women. There are female producers, directors of photography, composers, a female editor, and camera operators…even the titles are created by a female graphic artist. I’ve repeatedly suggested supporters of equality for women in film look on IMDB to confirm there are some female members of the crew before committing to seeing a film in the theater. It’s lovely to see the rooms in which they film their interviews is filled with female crew. Half the Picture has female producers, directors of photography, composers, a female editor, and camera operators…even the titles are created by a female graphic artist. Director Adrion choses to do a lot of interviews without fuss. For viewers looking for thrills and glitz, or who aren’t particularly interested in the subject, it might not have enough tricks, bells, or whistles. That, I think, was part of her method. She gets out of the way, and lets the women speak for themselves. It has proven to have been a good choice, as in its initial release Half the Picture has been very well received. One of the panelists on Women Rocking Hollywood said she’d recently seen Half the Picture, and she found herself moved to tears, so relieved was she to hear she wasn’t alone in her experience. I love that there’s a film that celebrates the work she and her sisters in film are doing, and that we can hear them speak candidly about the challenges they face, which are both real and unacceptable. For those who have committed to supporting women in film, this movie reaffirms why they have done so. For movie lovers who wonder what all the parity and inclusion rider fuss is all about, it is an eye-opening, sobering look into an industry that needs a complete overhaul. **These women have been on my Women Rocking Hollywood panel at San Diego Comic-Con. This week in movies sees the release of two films directed by women that focus on family. More specifically, they focus on father/daughter relationships. 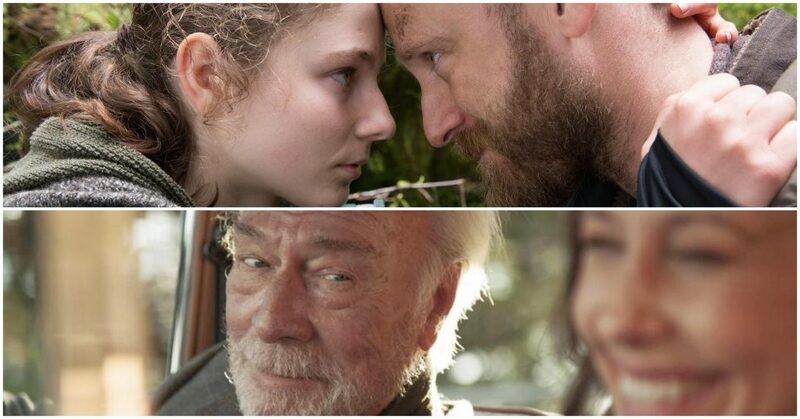 Leave No Trace and Boundaries are both road films, albeit of different sorts. Cinema Siren reviews them here, revealing who might enjoy them and who might want to avoid them. I saw a screening of the new indie release Leave No Trace on the summer solstice. It was also in the midst of a protracted, unpleasant parade of bad news. Co-writer/director Debra Granik, who brought us the bleak, beautiful A Winter’s Bone, which made a star of Jennifer Lawrence, now brings us a father and daughter story of haunting beauty using nature as a backdrop, which stars award-winning actor Ben Foster, and may once again create a mega star in Thomasin McKenzie. War veteran Will (Foster) has lived for years in the forests outside Portland, Oregon, with his teen daughter Tom (McKenzie). Their life is simple. They forage for food, play chess, and nightly hunker down to sleep in their tent. Tom studies, Will builds things, and they have discussions about nature. They also have near daily drills to teach Tom how to hide in the event someone wanders near their camp. We don’t know what has led Will to believe this is best for himself and his daughter, but we do know he has night terrors and no interest in living in an organized society of any kind. When discovered, they are put through a system that attempts to do what’s best for them both as individuals and as a family. When Will finds he can’t assimilate, the two set off into the wilds of nature, potentially with catastrophic consequences. This is basically the road (less traveled) trip movie. McKenzie brings an honesty to the innocence and kindness of Tom, who straddles childhood and a forced parenthood required when caring for a man suffering with PTSD. Their relationship to each other and to nature is a meditation on family, and the struggle to find autonomy inside a life living with a mentally ill loved one. Director Granik has a way of showing harsh realities alongside the tenderness between people. She portrays suffering without sentimentality, but finds the hope in her stories and shines a light on that hope to create compassion in the viewer. There is a moment where Will and Tom are in town, getting provisions, and Tom holds up a chocolate bar, asking their frequent question to each other, “Want or need?” The film, and the examination of the relationship between father and daughter, both of whom alternately play caretaker for each other, is couched in that question. Of course, we always want our parents and need our parents. We always want our children and need our children. When does the balance tip too far away from our own wants, and our own needs, and when is it right to choose ourselves? This heartbreaking, and ultimately hopeful ode to the nature of love and the love of nature comes right on time for anyone delights in thought-provoking fare and cherishes great filmmaking. Boundaries, a new indie from writer/director Shana Feste (Country Strong) exists on the opposite side of the spectrum of father/daughter road trip flicks. At once frothy and acerbic in tone, it stars the ever spectacular Christopher Plummer and ever compelling Vera Farmiga as Jack and Laura Jaconi, who navigate their estranged relationship as she drives him down the West Coast to LA in a beat-up Rolls Royce, her son Henry (Lewis MacDougall) and a constantly growing menagerie in tow. Jack has gotten kicked out of his retirement home for dealing weed. Laura needs money for an alternative high school for her weirdo son, who has been expelled for drawing a lewd, sexualized graphite of his teacher. He draws naked pictures of mostly everyone, exposing what says is their soul. Meanwhile, Laura is completely incapable of setting and keeping boundaries, as evidenced by her house full of stray creatures, and her willingness to engage with her lying, long-absentee father. She reminds him and all who’ll listen he is the reason for her emotional damage. They strike a deal that he will pay for Jack’s new school, and she will take him to LA. 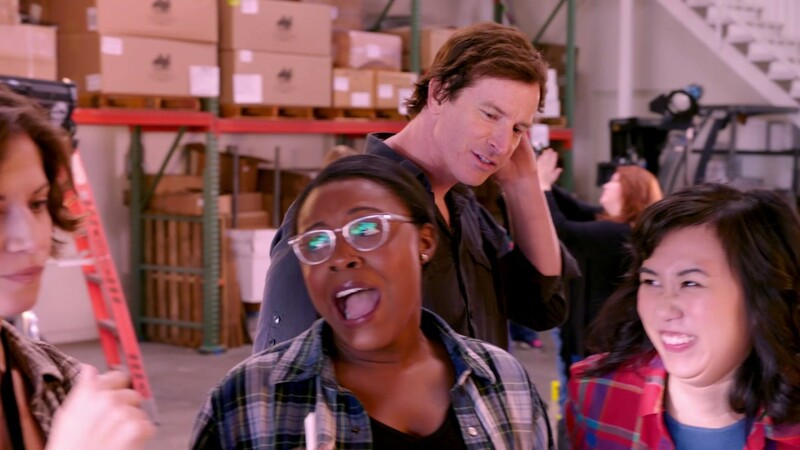 Jack ropes Henry into helping him sell $200,000 worth of pot, which they drop off to various quirky, free-spirited characters along their drive to LA. The story runs a fairly predictable course, but it is foremost Christopher Plummer who is the raison d’être for the film. It’s not his best, but he’s great. With hundreds of roles over his career, that’s not saying much. No one is particularly likable, but that’s part of the point here. Relationships, especially parent/child ones, are messy, and often suffer from bad history. Farmiga is portraying a female character not often seen as onscreen, which is to say, tough, unlikeable, and unapologetic. Is she a mess? Yes. So is everyone in Boundaries. That includes the characters we meet along their journey, which offers an opportunity to watch Christopher Lloyd, Bobby Cannavale, Kristen Schaal, Yahya Abdul-Mateen, and Peter Fonda create lasting impressions, and expand upon what are relatively cliched characters as written. Fonda in particular, though, is likely responsible for the smear campaign currently in progress on IMDB. He tweeted some incendiary messages to the Trump camp, which motivated the web trolls to score the film 1 out of 10. Don’t believe it. Many a film lover will enjoy Boundaries, even if Fonda doesn’t know how to keep his own, pre-release. There are many who struggle with messed up family dynamics, and deal with their dysfunction through humor, aware as they may be of their inability to truly deal with the underlying issues. Some families find a way to interact despite the bad blood and bad decisions that litter their collective story. To those I’d say, this film is for you. I’m sure you all have heard about how audiences assembled for Avengers: Infinity War. The Marvel superhero movie has broken the record for the biggest opening weekend ever. This weekend, another film, which features the closest thing to a real superhero we have in the US, is opening, and will make a great companion piece, especially if you crave an uplifting ending. 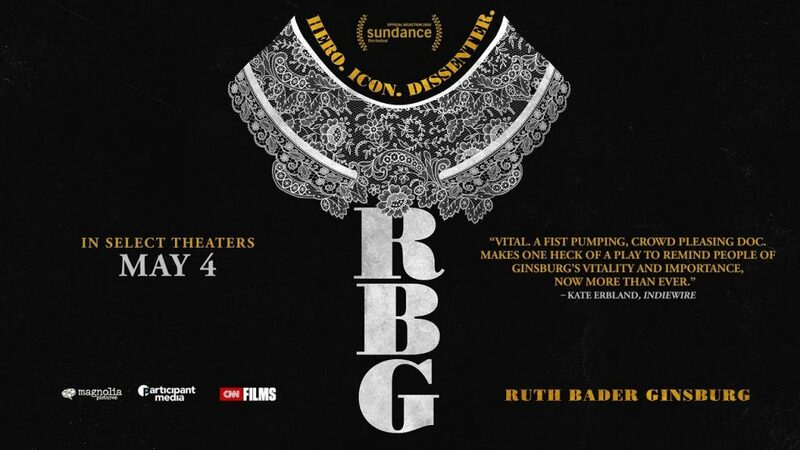 RBG, a biographical documentary on Associate Justice of the Supreme Court Ruth Bader Ginsburg, lands in theaters to remind people we should all aspire to be heroes in real life, and champions of truth, justice, and the American way come in all shapes and sizes. Co-directors Betsy West and Julie Cohen go about showing how and why at age 84, Ginsburg has become such a pop cultural icon. A staunch supporter of women’s rights who helped change laws to promote equality between the sexes, the documentary follows the tenacious octogenarian from her struggles with sexism in college and as a young lawyer, to her current place on a right-leaning Supreme Court. Showing examples of her influence through footage and audio recordings of a few high points of her career, viewers get a strong sense of how she helped create a safer, more welcoming environment for women in the workplace. The filmmakers also chronicle her life with her husband of 56 years, Martin, who supported her choices and celebrated her intelligence in a time when that was a far greater rarity among couples. West and Cohen offer a view of her personal life and quirks, including Ginsburg showing the collection of collars she wears on the bench, many of which are sent to her by fans and well-wishers from around the country. We see her determination and perseverance firsthand, as we watch her do planks and weights with her trainer, or hear her children talk about her penchant for staying up working through the night, often still getting only a few hours of sleep. For inspiration, you can’t beat this film, or its subject. It is also very gratifying to see the end credits filled with the names of women, who take the lead in every aspect of the production, from producing, to the score, editing, and cinematography. Not only do the filmmakers highlight one of the most important figures in “herstory”, they embrace the opportunities she has expanded for working women by putting them in all documentary’s positions of power. I challenge you to try getting through RBG without fan-girling. Sometimes there are films that remind us how grateful we are that independent films are released. With my focus being female filmmakers, that is the world in which I largely dwell, since so few movies put out by the studios are woman-directed. In fact, only 3% of studio films released in 2018 have a woman at the helm. Enter The Rider, which has gotten its director, US-based Chinese filmmaker Chloe Zhao, and the film itself, glowing reviews at festivals, and is coming to an arthouse theater near you. It examines masculinity, redemption, and resilience with such grace and delicacy in fairly brands itself in your memory. A neo-Realist narrative written by Zhao, The Rider blends real life and fiction as it focuses on a group of young Lakota cowboys playing the rodeo circuit. Real-life rodeo rider and horse trainer Brady Jandreau plays Brady Blackburn, who, just as Jandreau did himself, suffers from longterm damage caused by a near-fatal accident in the rodeo ring, when a horse he was riding kicked him in the head. He is determined to go back to competing in rodeos. It is his only means of support, and his prize money helps keep his family in the trailer his father rents for him and his sister. With little formal education, and the reservation on which they live having few options for employment, he tries to lean into the well-meaning pressure his circle of cowboy buddies place on him to get back to riding. His doctors, his family, and his body have other ideas. The film, which is really about Brady’s journey to figure out if he can leave the rodeo, which could kill him, behind, features non-actors as his family and friends. His real dad and sister (Tim and Lilly Jandreau) play his fictitious ones, and it’s amazing that they can be so real, and portray themselves so honestly, even in their weaknesses. Lilly has Asperger’s Syndrome, and yet she portrays herself in a poignant, authentic way. Lane Scott, a rodeo bull rider who was becoming known nationwide when he had a car accident that left him paralyzed and incapable of speech, is Brady’s best friend in both real life and in the film. Their scenes together show a sensitivity, a bone-deep kindness that acts as the anchor for Brady’s introspection and movement through his own challenges. I’m sure Zhao can be credited in part, not only for finding the truth in each moment, but also for committing to living on the reservation and getting to know the inner and everyday lives of those onscreen. Being with and spending time around the Lakota people, she said, made a huge difference in her understanding their experience. Zhao’s first feature Songs My Brother Taught Me was nominated for the Golden Camera Award at Cannes. The Rider has been similarly received, gathering thus far 11 award nominations and wins at festivals around the world, including at Cannes. The heartbreak of a life requiring drastic change and hard choices, the inspiring resilience shown by characters, and the examination of how, good or bad, close male friends express masculinity makes The Rider the sort of deep, meaningful film that reminds us why we are so lucky the independent film industry exists in the first place. The new indie release Oh Lucy, from Japanese-American writer/director Atsuko Hirayanagi, examines the life of Setsuko (Shinobu Terajima), a lonely, chain-smoking woman of a certain age. It’s the sort of film that captures well-crafted characters undergoing real change, with all the messiness, hilarity, and unpleasantness attached to it. After being confronted with mortality, Setsuko says yes to taking over one-on-one English lessons being conducted by unorthodox instructor John (Josh Hartnett). On the very first day of class, he places a platinum wig on her head and creates for her the American alter-ego Lucy. Her interactions with John start Setsuko on a strange personal journey that forces change, largely as a result of a series of very bad choices, not least of which include her following him to LA under false pretenses. Oh Lucy! has been called a Japanese-infused Hello My Name is Doris, and they do share a number of qualities, the most obvious of which is the largely unlikeable, yet compelling lead character. Actress Shinobu Terajima is a big star in her native Japan, and she brings an authenticity and what appears to be depression and a genuine struggle with internal conflict and chaos to Setsuko. She seems ever reserved and calm, but based on her decisions, she must be screaming on the inside. Hartnett’s John, as with nearly everyone in the film, vacillates between being someone for whom the viewer feels compassion and disgust. It’s the writer/director ability, through the action and dialogue, to yoyo the audience on an emotional string, that makes Oh Lucy! so fascinating and watchable. For a first feature, Hirayanagi had the great fortune to have master thespian Terajima bringing her cinematic vision to life. Clearly, the partnership between Hirayanagi and Terajima worked, and they captured something magical, albeit melancholy onscreen. In the end, though, Oh Lucy! is about peeling back layers, revealing what’s behind the masks we all wear everyday, and showing what’s behind them to not only those around us, but ourselves. In watching Setsuko as she drops away mask after mask, we can consider doing that for ourselves. That’s great catharsis, and worth two hours in the dark. Loving Vincent is the first fully oil painted feature film. The brainchild of two filmmakers who have worked in animation, special effects, and live action, the film breaks new ground, while being visually stunning and driving a story about the last few weeks in the life an artist who died penniless but is now one of the most famous in history. All the characters in the film are performed by real actors, either on special sets or in front of green screens, and their work is combined with computer animation and painted animation. There are over sixty-five thousand frames in the film, and at the end of each shot, they were left with the painting of the last frame of the shot. There are eight hundred and ninety-eight shots in the film. 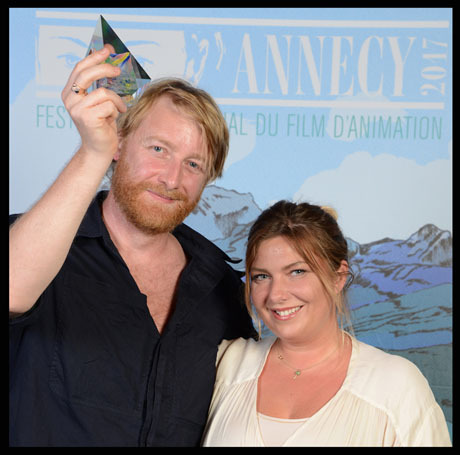 Clearly Loving Vincent is a labor of love for co-directors Dorota Kobiela and Hugh Welchman, both of whom are award-winning animators. They, like so many animators before them, are reaching, experimenting, and creating something more for the art form. To do it with the story and art of one of the most famous and misunderstood artists in history made perfect sense to them. The story takes place in France, in the summer of 1891. A character names Armand Roulin (Douglas Booth) is given a letter by his father Joseph (Chris O’Dowd) to deliver to Theo, Vincent Van Gogh’s brother. When he discovers Theo died shortly after Vincent, he becomes curious about the artist’s suicide and embarks on a search as to why the artist, who was just on the cusp of success, would commit suicide. He travels to the village of Auvers-sur-Oise, the location where Vincent passed, to meet Doctor Gachet (Jerome Flynn) who cared for him in his last days. Many people don’t know that Vincent survived the bullet wound he sustained to his abdomen in the fields where the shot took place, only to die several weeks later from a tortuously painful infection. This film considers what may have taken place on the day he was shot, and the subsequent time he spent suffering to his death. The characters portrayed in the film are all those found in paintings by the artist. 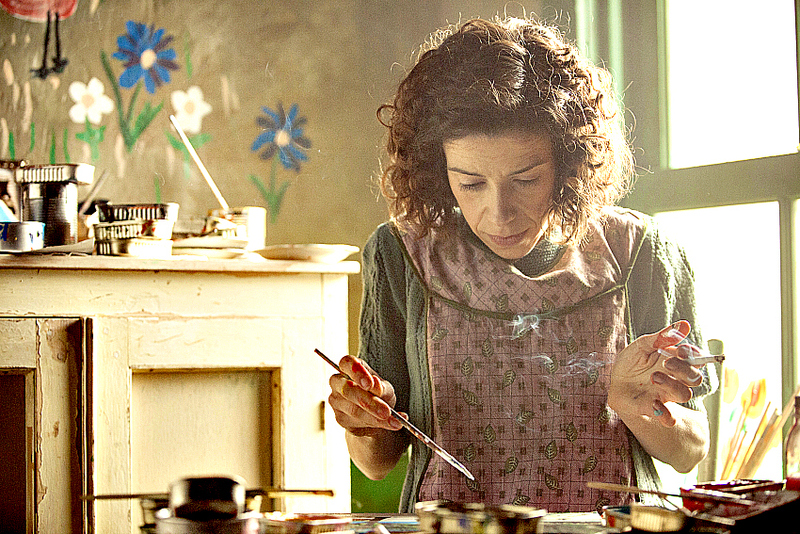 This film weaves the story around the paintings and the figures who were part of Van Gogh’s life. The plot is definitely the weak spot in this glorious film, but it isn’t really the point, I suppose. It is just the anchor for the stunning artistry represented onscreen. There are two art styles used in the film. 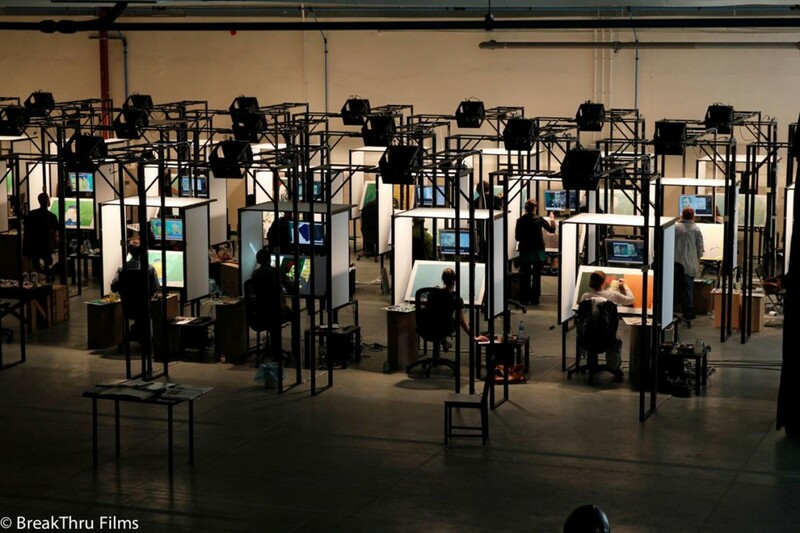 One is very much like rotoscope, where the actors are filmed and the paintings are created directly from their actions, making the scenes like very close to real life. These are created in black and white, and are not directly designed to look like Van Gogh paintings. The other style is taken from Van Gogh’s style, to the degree that a number of his paintings are re-created as part of the film. The rest of those sequences are done in the Van Gogh style, while revealing the plot. It’s a colossal undertaking that required 125 professional painters who worked in several countries, and had to be trained how to create these frames through a slow process of changing their paintings shot by shot. If only for curiosity’s sake, if not for the gorgeous end result, those who love animation should seek out Loving Vincent. It’s a testament to the fact that animators continue, after all these years, to continue to experiment and expand the art of animation. Equal parts cinematic drug trip and visual artistry, Loving Vincent represents a landmark in the genre. The Glorious Labor of LOVING VINCENT: An Interview with filmmakers Dorota Kobiela and Hugh Welchman. Cinema Siren spoke to the directors about their experience creating the film, which has already won the audience award at the Annecy Film Festival and Best Animated Film at the Shanghai International Film Festival. They discuss how they are premiering the film in a number of museums around the world, selling the original art used in the film, and the Painting Animation Work Stations (PAWS) they designed for the project.Leslie Combemale: Can you describe a little of how you designed PAWS? Hugh Welchman: Basically the idea is to have the painting animators concentrate on painting and nothing else. Not to worry about lights, computers, and only focus on their own painting. So we bolted everything to the floor, put it out their sightline so they could just walk in, sit down, and start painting. We wanted to give them as much references as possible, so the way that we created reference was different for each shot, pretty much it was either CG animation reference material or it was live action combined with matte paintings, or it was blank space they had to fill in, based on Vincent’s paintings. sometimes they just had a blank for the sky and they had to animate the sky, so one end of the spectrum was the black and white footage which was pretty much live action realistic footage, although always made up of matte paintings and materials with the effects done, so we didn’t have to do fancy effects so that was more rotoscope. The other end of the spectrum was the painting transitions where there was just one or two frames and the animators had to paint between them but all of the Van Gogh material essentially they have a live action reference but then they have to paint it as a Van Gogh painting and they had to animate each brushstroke, frame by frame. The thicker the brushstrokes the more precisely they had to animate them. In the black and white it’s more like animating on glass, you could smooth the paint around the canvas, whereas with the very definite brushstrokes you actually had to move very deliberately frame by frame by frame, like stop-motion. Dorota Kobiela: No, because with an in-betweener you’ve got a keyframe and another keyframe and you go from one to the other, knowing what’s coming. In this, the artist is doing all on one canvas and doing the keyframes and the art in-between. HW: What we had for them was outlined reference, so that they could project it on the canvas and use it as a starting point, but it had none of the detail on there. LC: So that’s more like an illustrator would work. So many different disciplines mixed together! HW: In terms of our background, we’ve done CG animation, for example, our last film was purely pencil drawing animation, and then the other film she did before that was actually painting animation in 3D. My last film was stop-motion, and we’ve both done visual effects, so we used and combined all of that in Loving Vincent, and the thing with Van Gogh’s paintings is they’re all different and some of them abide by the laws of physics, and some of them don’t. Some of them he used a wide or a long lens, and some of them were more like a set, so we took them one by one, those we used. With the portraits it’s pretty straightforward, in terms of shooting the portraits and then they have to be basically repainted in the Van Gogh style, and the big challenge was obviously not to lose the performance of the actors. One of the things that you very often get with rotoscoping technique is that you lose the performance you get a layer between you and the actor. On thing we did was we paid a lot of attention to the eyes. That’s the thing that animation can often fail at in creating realistic performances, so hopefully we found a way past that. LC: How did you choose the artists you worked with? DK: We received around 5000 applications. We first went through their portfolios, and based on that, we would invite artists to do a test, and this took around 3 days, which included painting in the Van Gogh style. Based on that test, they would go to another training. HW: From 5000 applications, we invited 500 people to do a 3 day audition, of those we selected 113 for training, and pretty much all of those went on to do at least one shot in the film, with 125 painters, although a lot of those came on towards the end. DK: The main crew was around 55 painters. HW: A lot of the time we had around 20 painters, that was our core group. LC: Dorota, you started out thinking you were going to paint the whole thing, did you paint any of the it? DK: I painted one shot. The boy throwing the stone. It has a kind of shaky camera portrait. I picked it because I thought it was just the beginning for me, and I wanted a challenge and to do something I hadn’t done before, and to train on it. I thought after that one i’d do a lot more fun ones with color, and then it didn’t happen! I mean, it was 4 hours per frame, and I could only start in the evenings after going through a day of directing so that would be after 6pm and then i’d have to work till 2pm and then start over at 8am, so you know, I didn’t think it would be wise! DK: I realize that we’ve been told we are crazy for how involved this project was, and so i’m glad you brought that up. HW: Snow White is a great one to bring up, because there were far more cels used for that film than paintings or frames used for our film. Of course on Snow White they had drawings, and concept art, and cels, and on our film we had paintings that we change and destroy as we go along. DK: Each painting is used for one shot, and there are around 900 shots in the movie, and each painting ends up as the last part of the shot. Sometimes the painting remained intact through the whole shot, sometimes we would scrape off the paint completely. Like with the moving camera shots… the first in the movie, you have Starry Night, then it moves to another image, and that shot was 10 seconds and painted over 7 months, put together with a number of painters who had different specialties. One was great with stars, another was best with tiny details of landscapes. It’s 12 frames per second, so it can take between 30 minutes for the easiest for up to 8 hours. Sometimes we would just scrape everything off and start again just to make sure and compare and get each image just right so they worked together. LC: How is it photographed, from above? DK: We had a camera mounted behind the painter, and they just would need to click. They could also see how they were doing and get a preview and see how it looked. They could export their image immediately, so I could look and check every frame, not in every single case, but for a long time we had an every frame approval system. They would have to check with the supervisor. And all the artists are getting paid per frame so waiting was an issue in terms of budget. HW: The whole schedule and budget was based on timing, so we had to get fast approval. Also we had people in different parts of the world all working at the same time. LC: How did financing come about for the film? HW: It was very difficult. Every time we showed the film we had made to explain what the feature would look like, we would be asked to give examples of other films done in the same way. We said the fun thing about this is it’s something new, and people will like it because it hadn’t been done before. At that point they disappeared! We thought the hardest part would be to hand-paint the film or to train the artists who are used to being individuals and working in their own studios, and putting them all next to each other and that was the easy part. The hard part was the financing. LC: Dorota, you are quite open about your own depression, that you’ve had it your whole life, can you talk about that and your connection to Van Gogh and what depression means to art. DK: I guess I always made the connection, and even wrote my thesis about it at university, how art and depression effect each other. I thought it was very interesting so many writers, philosophers, and painters had it, and specifically Van Gogh. I have always been curious about the passion and vulnerability of artists makes them more sensitive or maybe it’s the other way around, the illness opens up a part of you that allows you to see things in a different way and offers a unique insight. I don’t know which comes first. I was very interested in Van Gogh’s letters. I strongly believe that he was very intense and just worked too much, he was painting two paintings a day and writing all night. Writing 820 letters. HW: Surviving letters. Maybe way more existed. We don’t know. LC: I am particularly interested in the fact that, as a woman in animation, you have chosen to do something that’s never been done before, that required an immense amount of work, and a great deal of passion, that you put your whole heart into, that is so personal. HW: 75% of our painters were women. I have always tried to have women directors and heads of departments, but in Loving Vincent, it was a lovely surprise for us to have such a high percentage of women. In this case, it was purely because of skill and ability that it turned out that way. DK: This project required a lot of patience, and the women seemed to have that. LC: Well, of course most of the ink and paint department at Disney was made up of women and in addition to skill, there was a great deal of patience required for that. HW: I think the men found it to be too hard. DK: For the women it was fun because they were challenging each other. HW: They all wanted to be the best in the studio and became very competitive. In Poland our painters were divided equally between men and women, but in Greece, all our painters were women. LC: Talk to me about how you are selling the paintings used to make the film. It’s a great way to get back some of the budget before you’ve even released the movie…and you’re also having an exhibit of the art? HW: We have around a thousand paintings, from the film itself and also design paintings, because we spent six months doing design paintings before we started, re-imagining Vincent’s work. People were taking a full day or even a week to do those. One particular painting took a month! Of the thousand, a hundred and fifty we used for the financing of the film. Sometimes with the financiers and the actors, art was part of the deal. Each of the main actors got a painting of themselves and it was part of their contract. A hundred more we sold to the public along the way. We put them on our website and they would sell quite quickly..and we have an exhibition opening at the Noordbrabants Museum in Holland on October 13th which will have one hundred nineteen paintings of our favorite paintings from the film. That runs till the 28th of January. We’d like to license that exhibition to America after it closes there. We are doing smaller exhibits elsewhere, including the Kroller-Muller, which has the second largest collection of Van Gogh collection in the world. In the film, we reimagined twelve paintings of theirs, so we are doing a collaboration with them and it will tour around Europe and Asia and then it will go into the Kroller-Muller Museum, which is great for us, next year, for about three months. All of the art will be sold at some point, all of it will go for sale, but much of it will be in exhibits first. Of course they won’t all be very expensive, there are some of them that are less. For example, when the film fades to black, we painted that, and now we have these canvases that are black and some are really nice because they have thick paint. They won’t be much, but a fan will want them, I hope! All the money made from selling the art goes into recouping the film, because we have an investors pool and a talent pool for painters, we have a talent pool for actors, and for Dorota and I as directors. Still, we only really make any money if people go and see the film. LC: You have lots of great premieres planned! DK: Yes, we have a premiere with the National Gallery in London and the Musee D’Orsay in Paris. We are doing many of our national premieres in museums. With the National, it’s going to be broadcast in over 200 cinemas. We are doing an introduction that’s a walk through the National Gallery going to all the Van Gogh paintings and talking about them, which is about five or ten minutes, then we show the film, and then after the film we have a Q&A with all of the actors. For the Musee D’Orsay it is going to be in the big hall. The Van Gogh Museum in Amsterdam has a great space in their new building where we’ll have an event. LC: So you got Clint Mansell as the scoring artist for the movie. What a coup, and he adds a lot to the film! DK: He was involved in the film without even knowing about it. I would write the script listening to his scores, like The Fountain, Moon, and Black Swan. I wanted him, I built the story in my head with his music, so I really wanted him to be a part of it. To me this was important. LC: He is also very outspoken about depression and is a strong advocate as an artist who has it. I would imagine he’d be all over this project. DK: The truth is his music for me represents what I was looking for absolutely perfectly for the movie. HW: He said no five times. He wasn’t taking on any new projects. We first approached him in 2012 and each time he said no. I told Dorota it was time we started discussing other people or adding more than just one person to her list. She said she really wanted him, so we asked again and he said he’d meet us in person to say he wouldn’t be doing the project. We met him in person. DK: His agent called and said he would be in London the next day so we jumped on a plane so we could talk to him in person. We met with him and showed him a few shots we had from the film. Not even painted, but live action. Three hours later he invited us out to dinner, and then he said yes. LC: As a woman in animation how do you feel you informed the film? DK: To be honest what I’m really proud of and what I’m always getting a hard time for is how sensitive I am. How much pain and hardship I have to go through to deal with certain things. So many people say “Come on! Deal with it! Stop being so emotional!” It’s a part of me as a director, being empathetic and sensitive. I just think this is a part of me that needs to be that way. I am not going to be one of those directors, or women in business for that matter, who think they need to act like what some men are like on-set, shouting and cursing at people, because it’s not my nature. I think that my emotional, sensitive nature is really good for communicating with people. One time on the set, my male co-worker said something me, because he’d done lots of movies before. This was in Poland, and in Poland, there are so many men working in movies. There are no women apart from makeup and costume. The men dominate the production and are very aggressive. Very different than the UK. Anyway, he said, “You’re doing this all wrong. You have to shout at them, otherwise they won’t respect you.” I just don’t want to be respected by trying to be something I’m not. I am sensitive, but also my approach was to be really really prepared. That has always worked for me before and it worked on this. LC: What is your next project? DK: Well, this movie has been such a learning curve for us. But now we have some amazing painters and we want to do it again and continue to expand the style. We are a little bit obsessed with horror films, and we want to do a painted horror movie. HW: The thing about animation horror films is they are either funny or scary, but we think in our style we can do both. LC: Well, good luck with that, it sounds great. 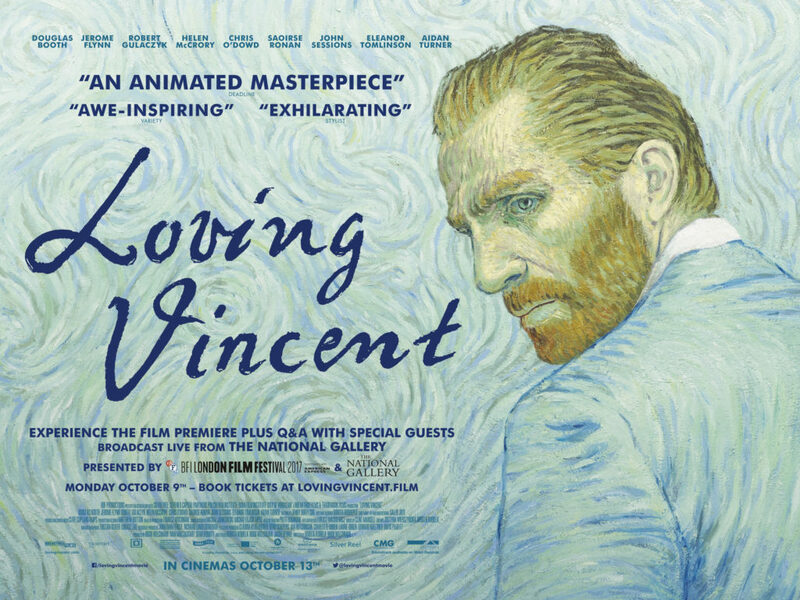 Good luck also with Loving Vincent. It’s a beautiful movie and I hope you have great success with it! *You may have noticed there are far more A grades on my site. I have slowly transitioned to interviewing almost exclusively people from films that I find very impressive. Also, I’m here to “guide film lovers through a sea of celluloid”…in a sea of releases, I’m working to focus more on films I think are worthy of your time. There will of course still be the occasional mediocre film represented here, but for the most part, I want to guide you all towards films that are worth getting up out and away from your chair/bed/computer. 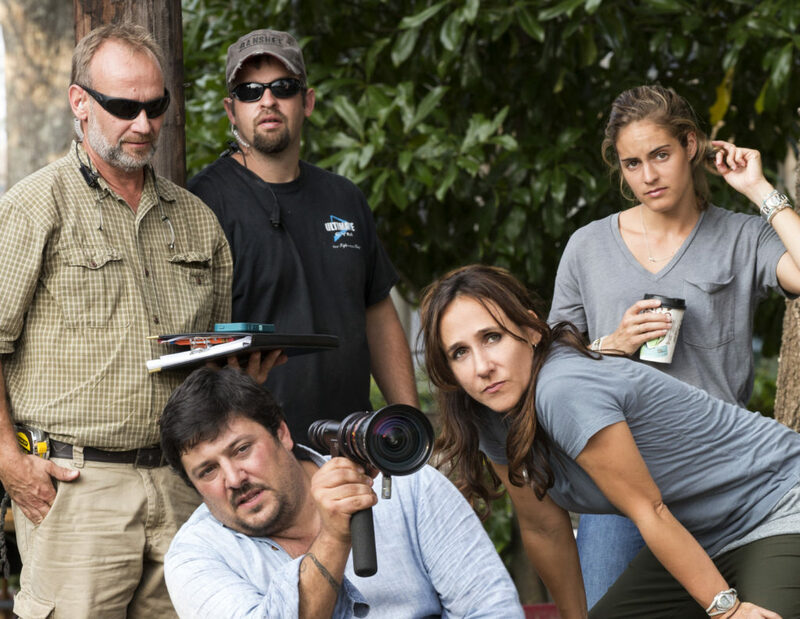 CINEMA SIREN INTERVIEW: Director of Megan Leavey Gabriela Cowperthwaite talks about female directors, female soldiers, the freedom of documentaries, and the gift of animal loyalty. Leslie Combemale for Cinema Siren: Kate Mara recommended you to direct this film. Would moving to narrative feature films been a natural progression for you, or is documentary work always going to be your focus, with occasional features? Gabriela Cowperthwaite: I thought of myself as a documentary filmmaker forever, and as a result of Blackfish, I got interest for me to work in features. It was agent-driven. My agent and manager came forward and asked if I would be interested in doing features. I said, “Yes! of course!” I love movies, it wasn’t something I had ever thought of but it was brought to me and I thought it sounded amazing. I started getting scripts, and became attached to another film and then this script arrived via Kate and she said she would love to recommend me to the producers, and I loved it and it all went super fast. We were on a plane. They were green-lit, they were ready to go, they just needed a director. It was very very quick. CS: You directing this story seems perfect, since not only had you directed Blackfish, but you’d also worked as an embedded filmmaker with the military in several countries at war. Having had those experience, what surprised you in making the film? GC: I tell people i wanted all my previous worlds to inform this one, so it was almost more in technique. What I love in documentary and what I’ve always loved is was not knowing what was going to happen. You show up with your camera and everything, you can plan and hope it will go a certain way, but it just never does. You just have to be so spry and so ready to recalibrate at a moment’s notice. The adrenaline that comes with that is a rush, but also when that thing happens it feels amazing. IT feels like a piece of magic. Going into narrative, I was like “how am going to find those moments?” I found myself engineering moments of spontaneity and letting actors ad lib and saying “forget about the lines, let’s just be”…that was an interesting challenge for the actors but they’re so good at a number of things and they were excited to have that freedom and be able to go off script so I think it worked. It definitely came from my documentary. CS: Are there examples of some of the ad libs that led to something inventive? GC: One thing very much was Common. Gunny Martin. His humor. Totally deadpan but it’s totally him. A lot of that isn’t scripted. Discovering that he, this larger than life, musician Oscar winning human is actually hilarious. He really was having fun with it. CS: Working with dogs and having them be so much a part of the story had to be interesting. You are so much an activist and so concerned about the safety of the animals. I know there are explosions and stuff and rightly lots of fans who love animals are concerned about them. Can you talk about that? GC: A lot of the explosions are enhanced by sound design so it doesn’t scare the dogs. That’s all post production for safety. There are loud noises on set, that’s for sure. What it would mostly be is loud noises would happen, the moment they heard them the first time, the second time, they weren’t startled as much. For me it was most important to do as few takes as possible with them. There are a number of dogs, so you never use one dog more than you need to or more than you should. But for me it was like, and everyone agreed with me on this, Kate, me, the producers, the trainers, they all knew he’s going to deliver. He’s the one you don’t need worry about. Kate is an animal person, she read him and they became buddies and bonded—professional actors that became friends…she knew what to do with him, he knew what to do to deliver, so it was just a matter of us being together and on top of it all. Are we rolling at the time? There’s no time to adjust the light. This is happening right now, and we’re not going to make him keep doing it. We’ve got to remember that. I gave a big pep talk about that even before we started shooting. The dog rules. Dog is number one on set. They don’t choose to be there. You’ve got to know that and make sure you make them comfortable in every way you possibly can. CS: What about this particular story really hooked you? What made you so passionate about wanting to do it? GC: I would say it was a full blown character and such a unique opportunity that you think you’ve heard before, a war story about someone being transformed by being at war and coming home. It was done through two completely unique agents, two completely unique access points. A female, a marine, we don’t hear about women in war very often and certainly not in movies, and a canine. It’s like a brothers-in-arms story, but there’s not a brother anywhere in sight. She felt fresh to me and cool and someone I could know. I liked that there were female writers behind it so she had some comebacks and things to say, and an authentic perspective. She was someone who you could tell was written by a woman. and honestly it was greenlit. What I’ve come to learn is with a documentary, I just get up and go. I find a story and grab a few shooters and we go do it. That is an amazing freedom that comes with documentaries. In the narrative feature world, you are asking permission to tell stories a million times over. It’s this dance you’re doing, it’s so strange and so new. You’re pitching it, you’re like but I know how to do this and this is how I’m going to go about it. It’s strange because to you it has been taken for granted that you just get up and go out and make a movie. When you find one that’s ready to push the go button, you’re finally let’s go! Really having it be “go time” was a huge factor. CS: as someone who has focused on documentaries, and as a woman, do you think it IS the freedom, and the fact that you don’t need permission, something we often struggle with as women, is the reason there are so many women in the field? GC: I think for sure we can’t underscore enough that you don’t have to have permission, you just go do it. I think that we are adept at paying attention to things that other people overlook. We aren’t going always for or driven to the shiny thing, the big thing, the thing that makes all the money. The obvious thing…we are driven to give a platform to someone that nobody’s paid attention to, an issue that nobody seems to care about, like unsung heroes. I do think women search for nuance and subtlety and we find beauty in those things. There are certainly men in documentaries that do that, and spectacularly well. We in the narrative world, I think we are still fighting this belief that we female directors are this big risk. CS: Wonder Woman is helping to change that, I hope. GC: It’s a huge deal, and it’s Patty Jenkins, and I will say this. She’s a phenomenal filmmaker and someone I’ve been aware of since Monster. If she was allowed not only to be the director of this film, but be listened to, and if her aesthetic and her work onscreen, and her creative mind they hired and checked off that box that they got a female film director…when they checked that box are you taking her creative mind with you? if that’s the case, if they have, it is gonna slay. If it doesn’t slay, it isn’t a Patty Jenkins issue. I’m going on record saying that. If they let her do her thing, it’s going to be amazing. CS: What is next for you? GC: I want to always do narrative and always do documentary. It would be amazing to play in both sandboxes. It’s just story-dependent. I have to love that story and feel like I’m the agent for it. Is a documentary the way in, or is narrative the way? It’s totally story-dependent. The next thing shifts all the time. Yes, there are piles of scripts I see, but they aren’t necessarily what i’m being considered for, but stories I’d go to the mat for. That’s the different between being a “FANCY” narrative director, and a new narrative director. CS: What are you hoping people are going to get out of this movie? GC: You know, a few things. I do think it’s a love story, a relationship story. The themes are loyalty and friendship and what having a bond means and how it changes you. I hope at some level people get that and are inspired by that. Those are the themes in real life that transform people every day. I also hope a couple of things: the third act was really important to me, her coming home and what it means to come home, and this was a very specific of that. Maybe if we can crack open what it means to come home through, that would be great. We say “thank you for your service”, but what does that mean? We say that, I think of that all the time. I have no idea what the veterans coming home have experienced or the depth of their service. I don’t know what they experienced. CS: with animals used in combat, you take that a step further, because they can’t tell you. GC: That’s right. You say thank you for you service and I want people to think about what service means. People come home and there are many times when they come home broken. How do we equip ourselves to help them get what they need? In Megan’s case, it was to partner her back with her dog. In their case, neither of them were whole without each other, and both were healed by being together. Hopefully it gives us a peek into how we can do that for everyone, and how to feel compassion for them. Animals and dogs are loyal and companions and I know that stuff in a general way, but when I learned about the canine unit, and I learned about the extent to which they sacrificed for hundreds of years by our human sides during wars fighting along side us and they don’t choose it the way we do. Showing them the respect and appreciation for what they have done, through their loyalty, is the least we can do for them. A powerful love story opens Friday, but it’s not a traditional romance or the usual Rom-Com fare. It’s the story of the love between a woman and her dog. To be more specific, it’s the story of two war heroes who find the kind of love with each other that saves them both. Megan Leavey is directed by Gabriela Cowperthwaite, who helmed the great, award-winning documentary Blackfish, which changed policy at Sea World and helped the plight of killer whales in captivity. 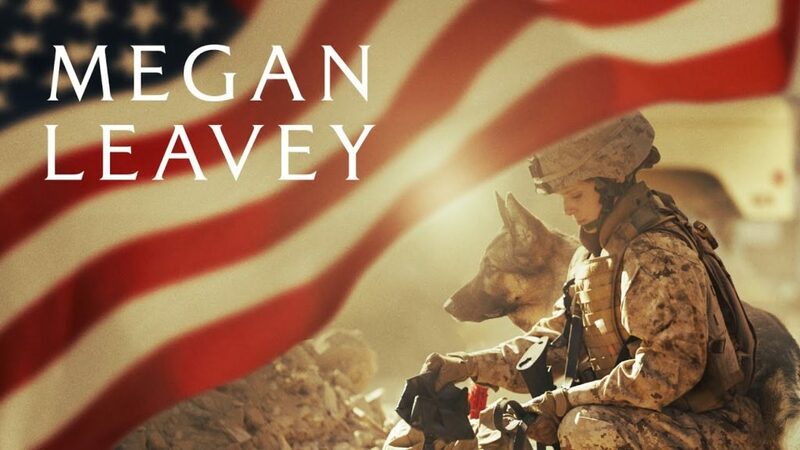 The film stars Kate Mara in the real-life female war hero Leavy, a marine corporal deployed in Iraq, who, with the help of her military combat dog Rex, completed over 100 missions until an IED explosion injured them both and caused them physical and emotional trauma that put them in jeopardy. They are separated when Leavey comes back stateside to recuperate, and Leavey has to find advocates in the government and in the military who will be willing to let her adopt Rex, like her, is a true hero, but has been classified as “unadoptable”. Kate Mara, as physically diminutive as she is, still has believability as a committed soldier, who, at a time when women weren’t in the frontlines, was actually in front of all the other soldiers, because she was with the K9 unit. Co-starring in Megan Leavey are some strong, award-winning character actors. Edie Falco plays Leavey’s mother, and being an animal lover she was quick to sign on to the film. It turned out she had a tie to the real-life hero. Only later did she discover that Megan Leavey’s father, who had been a Teamster, had driven her during her tenure on The Sopranos. Bradley Whitford plays her father, and he is never in a film or tv show he doesn’t elevate with his presence. Common, who is becoming known increasingly as an actor as well as Oscar-winning musician, plays Sergeant Martin, who helps with Leavey’s training in the K9 unit. In the press notes, it mentions Common used a pair of Marine consultants so he could really capture the sergeant who oversees the K9 training at Camp Pendleton without turning him into the expected stereotypical taskmaster. He does bring the character more dimension and interest. Ultimately, Megan Leavey just does a good job portraying of the kind of relationship all animal lovers will understand by getting out of the way and letting the story of the bravery of both the woman and the dog reveal itself. It also shows the power of animals to heal us from even the worst traumas. There is a great deal of documentation on the influence of animal therapy on veterans with PTSD. Megan Leavey really brings that message home in an inspiring and cathartic way.